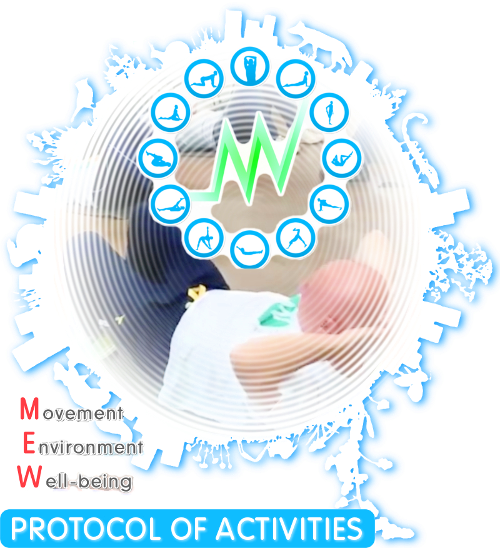 The volunteers who are carrying out the experimentation of the Mew Project activity protocol to fight sedentariness, after the mid-term meeting of december, met for the fourth time on saturday 12th of January. At the appointment of December, that represented the exact half of the experimentation period, the mid-term survey was conducted using three different tools: the International Physical Activity Questionnaire (IPAQ), the Quality of Life Enjoyment and Satisfaction Questionnaire - short version (Q-LES-QSF) (both able to measure perceptions and sensations in response to protocol application) and the recorded interview conducted using a questions battery designed by ICSSPE - International Council of Sport Science and Physical Education, in course of analysis by the University of the Foro Italico and subject of a report that will be drawn up by the same German partner. After one month from the survey, at the Abitart Hotel in Rome, the volunteers met again for the first meeting of the second quarter of experimentation. From the discussion about the progress of the training sheets application, has been emerged a widespread difficulty of the volunteers in carrying out push-ups; than the exercises have been simplified by reducing the workload or replaced by alternative proposals. The worksheets have been integrated with movements, always simple to execute and adaptable to everyone's daily life, aimed to strengthen legs and to complete the proposal made so far with exercise for chest, arms and abdominals. "From the physical point of view there are people who have lost weight and started to feel their body differently, describing the experience of different sensations and languages. Some have talked about muscles that didn’t think to had before, assigning also a specific function to the exercises learned" revealed the Trainer who follows the group Maurizio Paradisi, reporting some of the improvements observed. After the physical activities, the coaches made some sport-ricreational proposals, such as role-playing games and group experiences, aimed to improve the relationship skills: competences that have so far shown an important role in the perception of a psycho-physical wellbeing improvement by volunteers, despite the role of such dynamics is often underestimated within the discourse on the contrast to sedentariness. The group, for instance, unanimously expressed the desire to include in the program an out-of-town trip at the end of the experimentation, in order to combine the final meeting and measurements with social and convivial moments and an outdoor walk to do all together. Finally, meditation exercises to activate the concentration before doing physical activities were explained and the work on motivation, another key factor that has emerged so far, continued. In fact, during the discussions emerged the fear of losing motivation, technical and social support once the experimentation will be completed and participants expressed a willingness to continue together the work carried out so far, for example organizing small groups of people living nearby, who can continue to follow the directions of the protocol and support each other. The fourth and last italian multiplier sport event of the European project to fight sedentariness colled “MEW Project” took place on Sunday, December 2nd 2018, and combined physical activity in nature, psychophysical wellbeing and fun in the beautiful medieval town of Cittaducale. 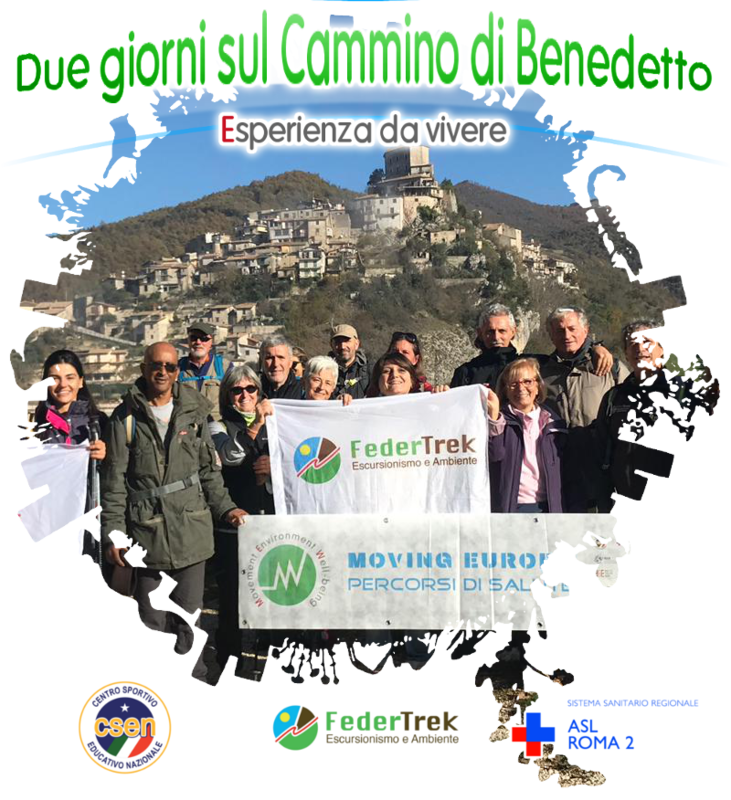 The excursion, organized by FederTrek and the GEP - Hiking Group of the Province of Rome Association, in collaboration with ANIAD, was conceived with two different itineraries, in order to be walkable by anyone: one longer and hiking (10 km, with 250 meters in altitude); the other simpler and for everyone (5 km, 100 meters in altitude). The first started in Paterno village and crossed the forest in a silent path painted with characteristic autumn colors. The second began directly from the ancient Baths of Vespasiano, dating back to the second century B.C. and functioning until the 4th century A.D. In addition to walking surrounded by nature, the event has in fact provided for the exploration of finds of villas, baths and ancient Roman roads, which have captivated all those present. The two itineraries converged in the town of Cittaducale, where Maria Domenica Calvani, the local guide, shown all the wonders guarded by the jewel of Lazio: from the Monastery of Santa Caterina d'Alessandria to the Cathedral, passing through the adjacent Bishop palace of the seventeenth century until the main square tower which, especially with the evocative lighting of the evening, always gives a fascinating atmosphere. The lunch was consumed inside the refectory of the Monastery of Santa Caterina d'Alessandria, where the participant could tasted local delicacies. Afterwards, the association ANIAD - Italian National Association of Diabetic Athletes, informed all present of the risks and conditions that triggered diabetes, a disease that is increasingly spreading in Italy. The intervening physicians distributed the questionnaires able to evaluate the disease risk and predisposition and were willing for further controls, where an high risk emerged. A warm greeting based on delicious sweets and a quick visit to the Christmas market with local and based on Trentino’s inspiration handcrafts were the last moments of the day, before leaving for the capital. "The rediscovery of an healthy, conscious and in company lifestyle had distinguished also this last experience of the MEW project and I am very satisfied with how people reacted, setting up a wonderful atmosphere of well-being, serenity and joy that made the time and kilometers fly even for those who did not think to could make it" commented Alessia Cella, guide of GEP association who, together with Gianluca Paloni and other guides, organized the event. Alessia Cella is also a volunteer who is participating in the experimentation of the activity protocol developed within the project and at the end of the event she underlined: "the synergy created between Federtrek and Csen for the MEW project is a winning strategy to promote an healthy lifestyle and I’m grateful for have being part of the organization of those events, free and open to everyone, which had the aim of spreading all this. But I am doubly grateful for the opportunity to give my personal contribution to a research that aims to identify a scientific model that can improve people's well-being, through a lifestyle in which I firmly believe, also made of experiences in nature and shared with others". Between Saturday 27 and Sunday 28 October, the 40 volunteers who started one month ago the experimentation of the activity protocol to fight sedentariness, developed within the European project “MEW”, took part in the first monitoring meeting. At the Abitart Hotel in Rome, on Saturday afternoon most of them gave their feedback about the protocol application to trainers, psychologists and experts who are following the experimentation on behalf of Csen, Asl Rome 2 and University of the Studies of Rome Foro Italico. After a first plenary reunion, the volunteers were divided into groups and worked on their motivation to participate in the experimentation and to reduce their sedentary lifestyle. Criticalities, benefits, impasse, changes and suggestions have been discussed, with the aim of obtaining the picture of the current situation and comparing it over time, to bring out any growth or decrease. On Sunday October 14th, the second Italian Multiplier Sport Event of the Mew Project, the events organized by CSEN in collaboration with FederTrek to promote free physical activity, able to improve the lifestyle of anyone and spread the project on which the National Educational Sports Center is working together with the University of Foro Italico, ASL Rome 2 and various European partners with the aim of fighting sedentariness, took place in Rome. 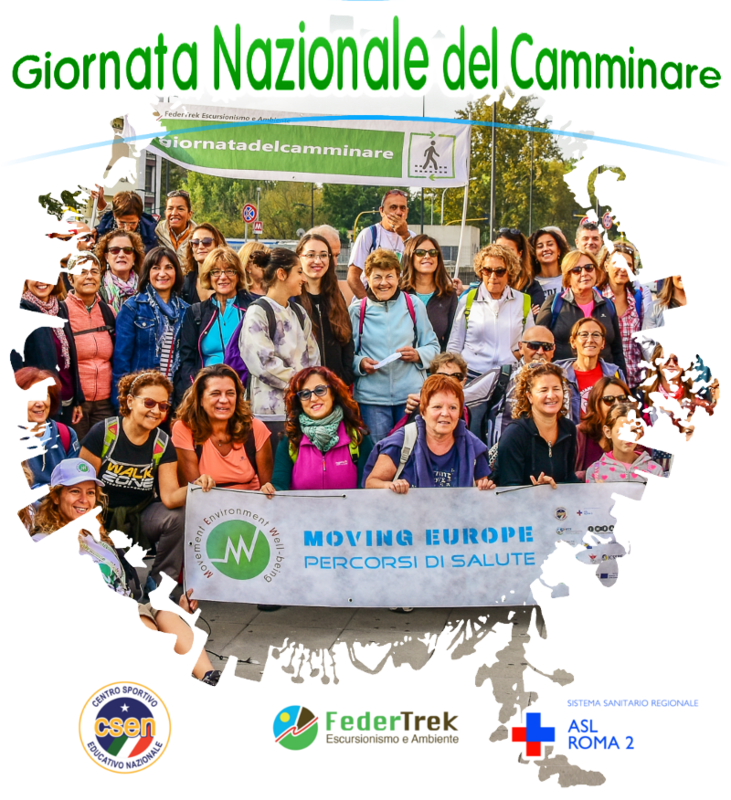 At the event, called “Moving Rome!” and organized as part of the FederTrek national initiative “National walking day", took part more than 250 participants, that crossed the capital walking for 18 km, starting at 8:30 in Conca d'Oro Square and arriving at the "City of the other Economy" at 16:30. The route passed through some of the most beautiful parks and places in the city, along alternative roads, cycle paths and historical streets. The first stop was at the Delle Valli Park, then the route continued on the cycle path that goes up to Salaria Street, crossed Villa Ada Park, had a short stop nearby the Bioparco and arrived in the middle of Villa Borghese Park, where the participants enjoyed a break with a picnic lunch thereabout the lake. From there, after a look out from the Pincio terrace and a stop in Piazza del Popolo, the walking lovers skirted the river Tiber using the cycle paths until reach Testaccio district. 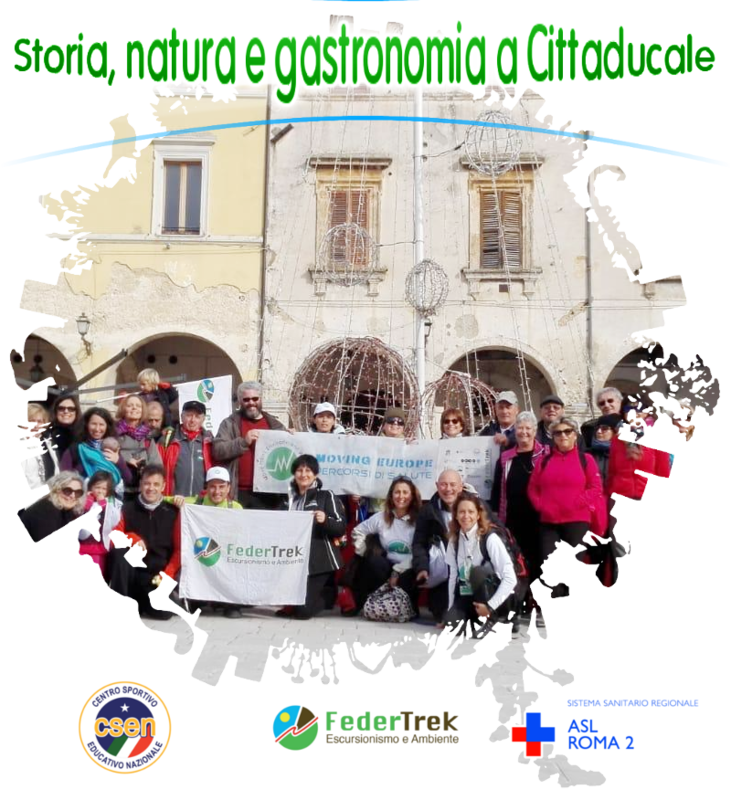 In the end, the atmosphere of serenity and friendship came up during the walk culminated in a wine and food tasting of typical organic products from Norcia and Castelluccio, with the possibility of buying some of the products from those earthquake areas. Finally, the organizers distributed the questionnaires to investigate the participants’ lifestyle and their motivation for taking part in the event, gave the Mew-branded water bottle to all those who returned the questionnaire filled in, illustrated all the phases of the Mew Project and the upcoming appointments with the next Italian Multiplier Sport Events organized by Csen and Federtrek. On September 29th, the meeting that kicked off the italian experimentation of the activity protocol developed by Csen, together with the University of Foro Italico, the ASL ROME 2 and the European partners within the MEW Project, took place at the Abitart Hotel in Rome. 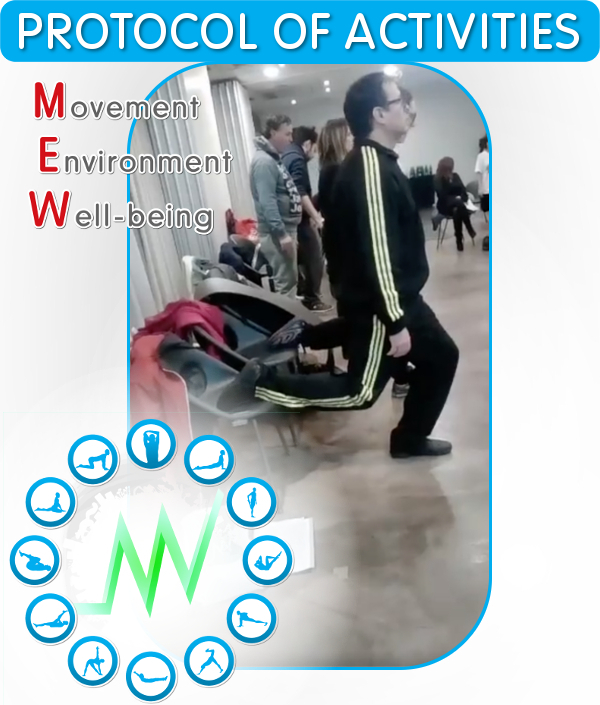 During the event, after the presentation and the welcome greetings, the 40 participants recruited between 30 and 55 years old troughout Italy to follow the MEW protocol’s indications and advice to say goodbye to their sedentary lifestyle received the project kit (with t-shirt, pedometer, towel, water bottle and other gadgets), the 1st month protocol and the logbook, to be filled in daily. The trainer who will follow the volounteers - both individually and in groups - has presented herself and let them try out the exercises of the first period, both those who will follow the training frontally and those who will follow them in streaming, as they live in different Regions of Italy. Finally, the participants learned about the dates of the meetings that will be held in Rome monthly, during wich the progress will be assessed, the protocol of the following month will be delivered and explained and any change to be made to the working method will be evaluated. As a medical support, ANIAD Onlus (National Association of Italian Diabetic Athletes) took the responsability to monitor the participants’ health status before and after the experimentation and gave them during the event the initial questionnaires (including the Tuomilehto questionnaire), that will be accompanied by the blood analysis. The meeting ended with a group picture of the participants, who will face this journey towards well-being together for six months, and a good luck for the first month of changes in their lifestyle. The Our_Tasks campaign has started!